A rough-sawn timber product cut to your sizes. If you need a smooth, ready-to-use finish, see: Planed timber. Enter your requirements to get prices, then add to basket to buy or save as a quote. Typically straight-grained with a brownish-white colour when dried. Dark brown streaks can sometimes be found in the heartwood. Our cut to size European Ash wood timber products (also called sawn to size) are literally sawn down to your chosen measurements and come straight off the saw with no machining performed to the edges, unlike our planed all round products. Our cut to size timber is untreated and is most commonly dried in kilns to remove moisture content. Sawn Ash is ideal if you don’t have the facility to cut timber down in-house. European Ash wood is ideal for shop fitting, furniture and cabinets. 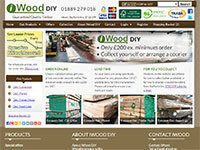 iWood is fast becoming the UK’s premier timber merchants. Our website is designed to give you prices faster than anyone else at prices you’ll love. Plus, you’ll instantly receive even better timber prices by signing up for one of our easy free website accounts. At iWood Timber Merchants we have built our reputation on supplying quality timber, ensuring you have the greatest % of usable European Ash timber possible from your delivery. We're sorry but Teak is currently not available to buy on our website. Please visit this page: Teak Wood to request a Teak Quote or call iWood on 01889 597281. Before you order this many pieces at this size, please give us a call on 01889 279018 to make sure we can supply to your schedule. In the meantime though, please feel free to carry on getting your prices. The minimum order amount is just £200 ex. VAT and specialises just in oak. The availability of 200mm and wider European Oak is limited. Please email your requirements to enquiries@iwood.co.uk and we can check availability for you.